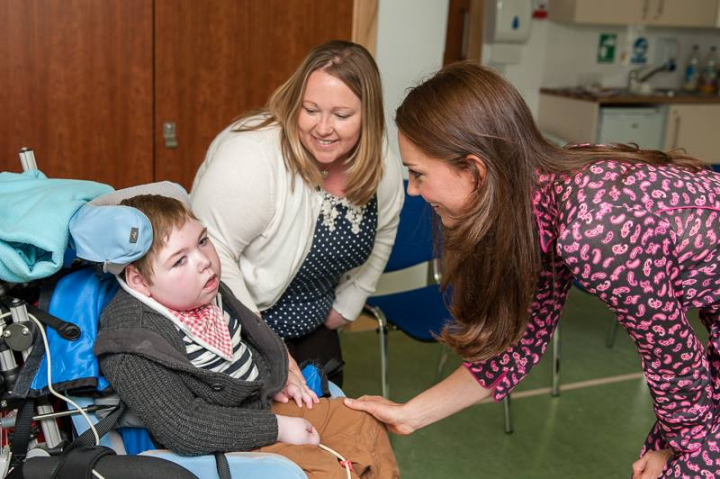 The Duchess of Cambridge made a private visit to East Anglia's Children's Hospices recently in support of Children's Hospice Week. Kate visited the organisation's Treehouse Hospice to learn more about the services that are required for families with seriously ill children, and especially the role that volunteers can play for children's hospices, which is an issue she is exploring with her foundation. 'Around the clock support is crucial for children receiving palliative care. 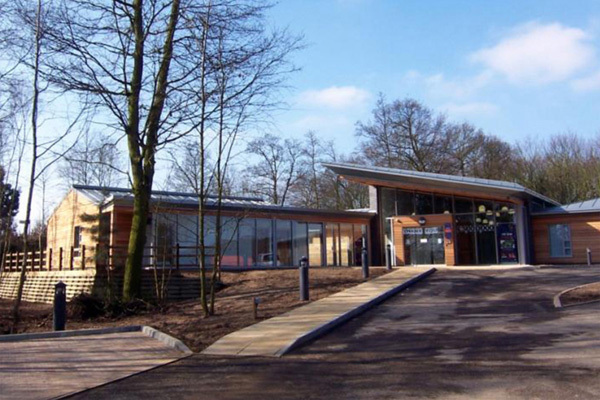 They and their families often need help every hour of the day, both in hospices and at home. As Patron of EACH, I have seen first-hand this remarkable and varied work and just how vital the support of staff and volunteers can be to the families of children with life limiting conditions. The Duchess is a committed supporter of children's hospices and wider palliative care, which provides a vital lifeline to children and their families at a terribly difficult time. One of Kate's first patronages announced in January 2012 was EACH, her response to an issue she personally finds very moving, no doubt even more so since she became a mother. It is an area she hopes to continue to learn more about and continue to lend her support to. I had a feeling Kate would do something for Children's Hospice Week and this visit seemed a perfect way to mix behind-the-scenes charity work with raising awareness. Of course this isn't Kate's first visit to Treehouse Hospice. In March 2012 she carried out her first public engagement with EACH as its patron, opening the facility. During the visit, Kate made her first public speech in which she described her admiration for EACH: "What you do is inspirational; it is a shining example of the support and the care that is delivered, not just here, but in the children's hospice movement at large, up and down the country." Since then Kate has carried out a number of engagements at hospices both at home and abroad. Most recently, during the royal tour of New Zealand and Australia, Kate visited Rainbow Place in Cambridge and Bear Cottage Hospice in Sydney. Children's Hospice Week is the only awareness and fundraising week for children with life-limiting conditions and the services, like hospices, that support them. This year Children's Hospice Week has promoted the #WeCare247 campaign to focus on the complex round-the-clock care that seriously ill children require, and the roles that children's hospices and palliative care services are there to provide, from nurses and carers to counsellors and volunteers. There are a number of ways to support the week including fundraising and making a donation. One can make a single or monthly donation by visiting the official website. If you're considering supporting Children's Hospice Week or your local hospice I would urge you to watch Tilly May's story, a brief video which offers a first-hand insight into the importance of hospices from a parent's perspective. Last year Kate recorded a video message in support of Children's Hospice Week to show her support. For the visit, ensuring the focus remained on the importance of hospice week Kate chose a Diane von Furstenberg dress she's had in her possession since 2002 when she wore it to a party at St. Andrews University. Kate wore it again in 2005 for dinner with Prince William. 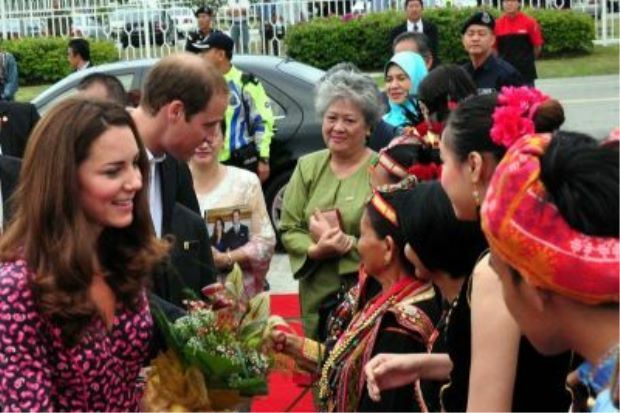 The Duchess also wore it in 2012 when the couple departed Sabah, East Malaysia. 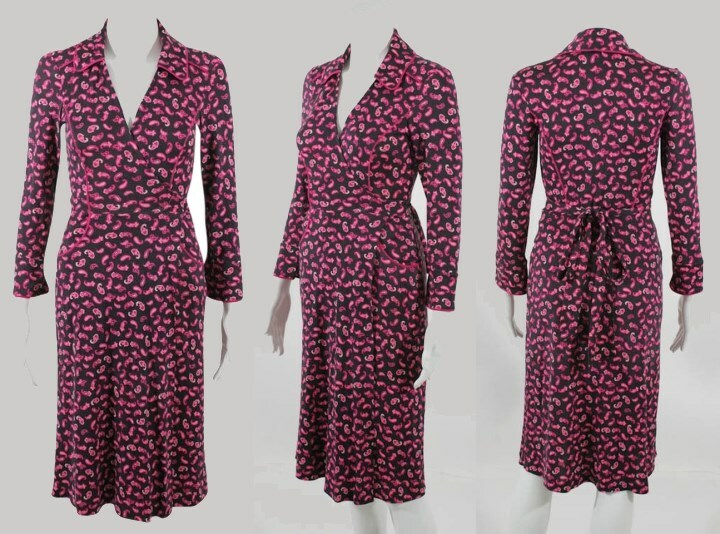 The pretty pink and black dress features a paisley pattern. It is 100% silk with three-quarter length sleeves in a v-neck style with a self-belt. It's unmistakably DVF, even though it's a design from over a decade ago. Ms von Furstenberg's signature elements are very much apparent. It's excellent to see Kate carrying out under-the-radar charity visits. Without the media there, one imagines it offers a much better opportunity for the Duchess to speak with staff and families. This is exactly the sort of organisation she can impact positively through her patronage, and what a very special cause to support. Well done to Kate today. What a deserving patronage and how lucky they are to have her. She truly cares for children as we know for years. Wasnt too gone on that dress though! Too much going on in it for me.. Love Kate shes wonderful. Great post Charlotte. I think the Duchess always shines the most brightly when working with children. You can tell she absolutely loves being around children. I think that sometimes people think the Duchess dresses a bit boring but to me it is very classic with clean lines. She has had this dress in her wardrobe for over ten years and it can be worn today and looks very much like something you could buy today as far as the print and cut goes. I am so glad she took time to go visit today to help continue bringing awareness to this cause. SO great that she marked this week in some way. Was afraid that it would be overlooked from her side but now I understand why it wasn't pre-announced. It's better for the kids without all the media and the hoopla around her! Rebecca, I was thinking the same thing, how much better for the children, staff and Kate that she could simply arrive and do her Magical thing with out all the Media drama. Exactly! Of course they know beforehand. Because of security issues and so on. But good that the families doesn't have to deal with the media! This is a huge part of why I love to follow Kate - she recognized that this visit needed to be about the children instead of making a fashion statement. And the fact that she is still putting on a dress that she's had in her closet for OVER 10 YEARS makes her so relatable! She obviously has great fashion taste because I would never have guessed that this is a dress that she's had for so long. Maybe I'm just fashion clueless but it looked completely new to me LOL Thanks again for the quick update on Kate's visit to EACH! Great Post!! I am happy that she has done something for EACH, I kinda was worried that she wouldn't. Do you think she could spend more time wtith the children and staff when it is a behind-the-scenes visit? There are no more days in her calendar for June right?? Love seeing Catherine so engaged, thank you Charlotte for another great post! We don't know how many of these "under the radar" visits she makes and we have certainly heard of quite a few by Priince William. They will both probably have more than half a century of supporting charities--so they will want to know exactly what they do. I felt sure she would do something for Hospice Week---but so many members of the family are patrons of a Hospice, that I would think she has to be very careful where she visits. Think the dress looks lovely---can't believe it is 12 years old. Thanks for all the information Charlotte wasn't expecting anything today. A new Children's Hospice is being prepared about 100 yards from my home--keeping my fingers crossed that it might be one Catherine takes on board!! Thank you for confirming this visit. I'm sure the Duchess does far more for her charities below the radar than people think. Unfortunately, the naysayers seem to think that unless she is in the middle of a media circus, she isn't doing anything at all and that simply isn't true. It really is hard to believe that people can be so judgmental and cruel. That's why I focus my interest on blogs like this one. Thank you so much for doing it. I completely agree with you, Jane. I suppose it would be too much to hope that the people who think that she does nothing unless the media knows about it, will think twice before accusing her of not working hard, after reading this. She has a bigger life than most of us do and managing it and succeeding at it, takes hard work. If she were working harder, more secret visits would have been leaked. I think that her image is being salvaged, at this point. You know wolfpup, you usually always have some negative theme to your comments, it is really irritating. How do you know that if she were doing more secret visits they would be leaked? I know that everyone here is entitled to their opinion, but really, seeing your pessimistic comments about every post is getting old, IMPO. 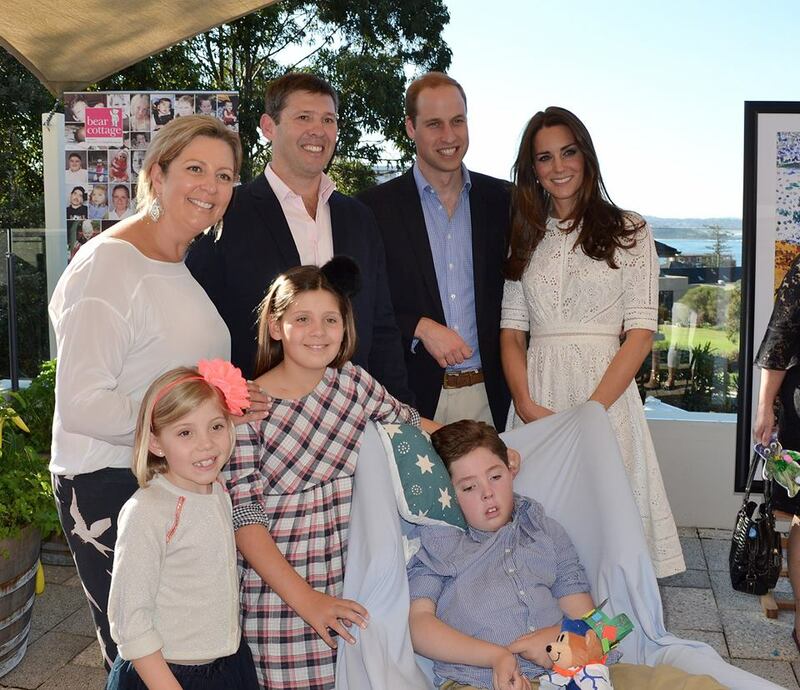 Kate went out, in private, to a HOSPICE FOR CHILDREN! I do not think she is trying to salvage her image by using sick and dying children to do it. You, wolfpup, should be ashamed of that kind of thinking, and your comment. I'm sorry to anyone that doesn't agree with my own comment here, but this really upset me and set me off. I feel very VERY strongly about children being sick, and they deserve the very best that we can give them and do for them, and that is exactly what Kate was doing here (and does regularly). Sorry Charlotte, but I had to say something, I couldn't keep it in. Ack. Lost my comment! I was going to end by saying that I feel validated by Kate wearing a 12-year-old dress; I have too many "old" things in my closet that I can't part with because I love wearing them. And a P.S. : I LIKE cynics, wolfpup!! You make me think things through carefully. Thank you. Jenn frm NC-you aren't the only one not holding it in- check me out further on down, re: bluhare. Don't know what I'd do tonight without you all to visit with. It has been a Murphy's law day or 30 for me. This really helps get my mind off things for awhile. That ,and literally counting my blessings. Hope you and yours are ok, ESTI. JO- not what I meant about devil's food, but I am sure you chose to rise above. Chocolate sounds good, too. I think my Mom used to put maraschino cherry juice in it, with whole cherries on top. Sounds almost as good as bluhare's plum cake. CAMILLA- what the heck has been going on with Pices? CHARLOTTE- Thank-you so much! We couldn't do any of this without you. Camilla- appreciate your asking for clarification. Somehow I got it in my head that you studied astrology. I am a Pices and been having a run of bad luck. Just grasping at straws. Will the person who actually does follow astrology give me some imput, please? Marg, I'm not the astrologer--just someone who hopes that this rough road will soon smooth out for you. You are a very strong lady ---which by no means guarantees that things are always easy--as you know---and a sense of your own strength gives you something that you KNOW you can depend on..it's a quiet sureness, which is hard to explain, but when you're strong, you know it's there and that you can depend on it to get you through anything. Please let me know how you're doing. Marg, so sorry to hear you're having troubles. I do hope that things turn around for you very soon. I sympathize with you, hasn't been very good for me lately either. But Jo is right, you are a strong woman, we just have to have faith that things will get better. Sometimes I don't know what I would do without this wonderful blog of Charlotte's either, or the amazing women here (and Sam too ;) ). That's great recycling! Lovely post. Lovely visit to the hospice, and nice that it was without media, though obviously with photographer. The dress is not my favorite colors, nor Kate's best ones, but it should please those who want her to go back to her pre-wedding way of dressing. Her talent for recycling is very nice. Gee whiz , Wolfpup....farther down, I've said hi and wondered where you've been and if you're OK...one can't always be chirpy, but you feel better if you disagree in a positive way....not to be nauseating about it....just trying to help. Yay! So glad she made time for the hospice! Not a fan of the dress since I do not like the pattern but it looks nice on her. That dress would probably look horrible on me, but it looks GORGEOUS on her!!! The color goes beautifully with her skin and hair. Good look on Kate, definitely. Penny, I love seeing young people here. I think Kate is a wonderful role model. I can only hope this will put to rest that in fact Catherine does work under the rader. Many believe she does norhing except when the media has their cameras in her face. Well people she does work more then you think. Agree! But I think that from a PR standpoint it would be nice if they at least put in the official calender afterwards so that naysayers don't have any ammunition. But I agree that visits to the hospices is best done under the radar, without the media. Besides the excellent work for her charity, let me get straight to the wow factor ; ) How many of us are wearing dresses we wore 14 years ago? A huge node to Kate's timeless taste, weight maintenance, and ability to care for her clothing impeccably! Not to mention her inclination to recycle her wardrobe from college co-ed to royalty - pretty impressive! I totally agree. I sure couldn't (ofc, 12-14 years ago I was 7-9 years old :-P). How can she keep them all in that good state?! Charlotte, as always, you provide such wonderful information on the charity and work Catherine does. Reading this blog is such a pleasure. Not only do we get to keep updated on Catherine and her beautiful sartorial choices, I am constantly learning something new. Thank you again for taking such care in writing these posts. I think it is so wonderful how involved Catherine is with this charity. While nobody is perfect, it really seems Kate understands her role as a mother, duchess, wife, and spokesperson and does such a great job. She is a woman of such grace, humility, and beauty. Have a great day! I also agree, very well said Alexandra! Thank you Alexandra, I echo these replies. Beautifully written. Love this dress! I knew she would come through for Hospice week and I love that she visited each privately. She's a class act. CAMILLA- (sorry, but it is so strange for me to use that name;we'll get used to it.) Please note the "LOAD MORE " button at the bottom of each comment page of 200 or more responses. . Keep pushing or pointing each new page until there aren't any more. Your explanation was printed, read, and greatly appreciated!!! Charlotte, haven't read the new post yet, but it looks wonderful. Have been mentally preparing myself for a long dry spell. Should have known you wouldn't disappoint. I just hate the idea that somewhere Camilla thinks she hasn't been heard and appreciated. I am sure her ego can handle it, but sometimes people can't take one last straw and we never know for sure, so must be kind , just in case. PS I have a niece named Camilla. It is a beautiful name. We used to call her Cami-or Cammy. We pronounced it" CAM-il-la." Marg- Since you posted your message, I went back to the original post. I thought Camilla and Anon from Leo made very good points. Whether we agree with everything others write or not, I really appreciate the diversity of opinions on the blog and respect that Camilla's comment was clarified. Some of my favorite posters I tend not to agree with, but they make me think about things in a new light. In case you missed my response back to you Marg about military bed sheet corner folding- I really got frustrated that my husband never did them right. Thank you for clarifying it is a just me thing. Is it wrong to say I may say a silent thank you to you each time I am less annoyed he did it wrong again!? Jennifer- Mom kind of drove me nuts about it, but I still do hospital corners at home.It is neater and stays put better. Tell your Mr. that! That doggone load more button. I think Charlotte should post a notice about it in an obvious place. It kind of broke my heart when Camilla responded and had not seen our positive messages. Did you notice if Jo answered my question about how tiaras were going to work with our halos? At least I hope we go the same place. I don't know if that other place would let us come back for Wiliam and Catherine's coronation. Ha! At least I should have a good tan. I secretly hope some non tragic event will allow them to be crowned sooner, rather than later. Although, I still wonder if the Cambridges wouldn't prefer a private life. HELEN promised to think on that one and get back to us. Thank-you for the invite to your coronation house party. One problem- will we be able to enjoy the delicious snacks and liquid refreshments you will undoubtedly serve? I just realized something- isn'there a halo tiarra? Thank you, Marg, I never noticed the load more button! My ego is all right, as you guessed :) I was just very worried that my explanation might never reach you, as you all deserved it. About today's post, I'd say Kate's using college dresses makes a strong point about not just her long-held taste, but about her confidence and independence. She didn't feel to build a whole new royal wardrobe - she just integrated what she already had. It's a clear statement of 'I am who I have always been' and 'I'm not afraid to be too little for the royal family'. I think this kind of confidence - in want for a better word - bodes very well for a future queen. Hi Camilla! Kate may be reacting to what a previous poster said about Charles not wanting to pay for her clothes!! She' never resorted to an outfit THAT old in public----or maybe she figured it was such an informal visit that it wouldn't make the news. MARG & JENNIFER!!! Even after hitting the load more spot to the very end, I didn't find my reply about going to W&K' coronation or the tiara-halo question!! Don't know if it's ME or this phone---sometimes if the thread gets too long, it refuses to cooperate and sends me back to the top!! I' m missing a lot no doubt!!! Marg--of COURSE you're going to Heaven--and I love the NON-TRAGIC comment....although I 'm not sure whay form thay could take!! Oops! Marg--can't BELIEVE I forgot about our Halo/Tiaras!! Maybe to attend Coronations, royal weddings and such, we'll be able to design our own tiaras-- I hope I can take my tiara that I found in cataligue--it looks for all the world like The Queen's Girls of Great Britain & Ireland tiara or, as she calls it "Granny's tiara." For W&K's wedding, I set it next to me on a velvet cushion--didn't wear it--I was in my lovely new nightgown bought specially for the occasion. It just glittered quietly next to me. Camilla- I agree with you wholeheartedly about Kate's confidence and I bet it's one of the reasons William loves her- she is not afraid to be herself. Jo, I'm the last to defend Charles (you may have noticed...lol), but I don't believe that choosing this dress had anything to do with him or any financial arrangement. Do you recall when Kate wore her mother's dress? Her wardrobe was just fine before she got married so I doubt this calls for a tin cup, if you know what I mean. :) I honestly cannot read any more into it than her being a confident woman who is making it clear that fashion doesn't control or define her. Jennifer and Jo- I'm speechless. Camilla-such a great comment! "I am who I have always been." Jennifer--aren't you an angel to be such a thoughtful hostess!! I guess devil's food wouldn't be appropriate--but it WOULD be chocolate!! by wearing such a classic for so long! Marg and Jennifer---Funny we both thought of devil's food---of course only in terms of chocolate! Well, about the Charles-won't-pay-for clothes story: Kate's parents are millionare, and she worn expensive clothes well before her royal marriage*. So I'd say, if she wanted new clothes, she could get new clothes. Camilla 10:49- you explain your point well. So good to see HRH carrying out an under the wire visit on behalf of her patronage, EACH. It's very serious business and I applaud her for going off the grid so to speak. This woman has such heart! Of the many things she can show her support for, this to me is just huge and no way is it easy. Now I have to comment on the dress. Listen the only thing left in my closet from 2002 MIGHT be an old purse. I am not even sure where we were living in 2002! I can not begin to imagine the size of the closet that houses all of HRH clothes let alone the fact that she has schlepped these items from place to place all these years. WOW! Of course now someone probably does the packing but still.........1! As for the dress itself, I like it, I feel it's very basic like many of DVF's dresses that HRH wears. HAPPY WEEK-END EVERYONE. Thank you Charlotte for this informative post. I really like this look on Kate. To be honest, I haven't cared for many of the outfits that Kate has worn this year, but this one is winner in my book--an "oldie but goody." I think it strikes just the right tone: not too casual and not too dressy. Kate always looks good in wrap dresses. And the bright pink/rose is a very flattering color on her. It really brightens up her complexion and gives her a nice “glow”—she should wear this shade more often. I, too, have clothes in my closest that are more than 10 years old that I still wear. If they’re still in style and still look good, why not? This is my first time commenting on your blog—which I love, by the way. Thanks for posting this! Anon 19:28, I totally agree with you. Even though Kate has had this for many years, it was such a breathe of fresh air to see her wear something with color, real color! It seems like its been so long, all we have seen lately are pale dresses. And welcome to the blog! I wish you had put your name :). I hope you keep posting. Take care. Fantastic! Very happy to see Childrens Hospice being highlighted. Tough subject to take on; heartbreaking for all involved. Well done Kate and everyone else involved. I absolutely love that Kate is not afraid to wear a 10-year old dress unlike many others in the spotlight who wear something just once. One can't help but think of the late Princess Diana who carried out many visits like these: "secret" in the sense that they were not advertised or hyped. Therefore, it is no surprise that the wife of the late Princess's son would carry out these secret visits. In addition, I am impressed that she chose this charity which must be challenging as it is so emotionally charged. I love the DVF print dress, especially because it is not the "busy" print that is so trendy now and the Duchess wore it well. But it's nothing new really. Diana did the same thing when the cost of her wardrobe was debated. She would turn up in something "old" and the same editors that were criticizing her for spending too much were denied "new" pictures and that affected *their* wallets. So right you are royalfan. On many levels! A really great cause and one in which all countries should have available. Nice to see Kate doing something like this without all the fanfare, just being there. I can't really say whether I like this dress or not. Would have been nice to see her in a full shot so I could get a better idea of what it looks like now that she is a bit slimer than her uni days. Im not a fan of wrap dresses but I like the colour. I like the dress; I remembered seeing photos of Kate wearing it before. Strange that the photos were released some time after the visit. As an aside, I am enjoying the tv programme 'I want to marry Harry' although it features a 'fake' Prince Harry. Omg that show is like a horrible car accident. You cringe and feel so bad for whoever is involved in it but yet you somehow can't look away. I enjoy watching it as well hahaha. They cancelled it though :( apparently the ratings weren't doing so well. Anon- London and Blair- I actually watched!! You nailed it- a train wreck! it was an over-done, cartoonish presentation, relying on sterotypes and the underside of human nature. In other words, a typical reality show. I hope that Matt fellow has a future somewhere. He is a cutie, but also dealt quite well , considering the circumstances, with a ridiculous situation. He was natural, honest, and unpretentious- like his name-sake. I am so pleased to see Kate make an appearance this week to support one of her causes. I think this is enough said and a perfect example of "action speaks louder than words." Charlotte, you mentioned the media weren't invited, which has me thinking that the visit might not have received as much recognition as it deserved. I am hoping EACH has their own agenda to use Kate's visit to bring this charity's work to the public's attention. Perhaps 1 or 2 well reputed reporters would not have gone amiss. I'm wondering to whose discretion this was? I also do hope Kate goes ahead and does another video for EACH in the near future. Always love this style on Kate. Wrap dresses suit her immensely, and her pre-wedding dresses have always been a hit. I guess it's just a non-annnounced event. But there's a photographer, and they make it public later. So you get both the secrecy and the publicity. Camilla 07:46- Good point! "Both the secrecy and the publicity." Allows a quiet visit with the children, families, and staff as well as a record and publicity tool for the hospice. The staff and surroundings were obviously not in party/ VIP visit mode: I refer to the very casual tea arrangements, not to mention the expressios and attire of the staff. A thought- it also sticks it to the paps! Added bonus! and not be so critical. I like that she did the engagement in secret. Good to see that she still can go unrecognised even if she is on an official trip! Right! In another post I recall saying that Catherine was likely quietly working under the radar. Some people are (all too) quick to call the Duchess lazy if she isn't sighted "doing" something every two minutes; however, I'm sure that there is a great deal that this amazing woman does that we know nothing about. Plus, we're not entitled to know everything about her life--or judge her, for that matter--simply because we need to feed our need to see what she wears. A 9 year-old dress this time. Wow! Classic and timeless. LOL. Makes me want to tolerate my own wardrobe better. Philly, I agree with you completely. Your comment about not being entitled to know everything and especially not entitled to judge her, was spot on IMO. I feel very strongly about people judging other people (especially judging me). I do not agree with it at all. Everyone, absolutely everyone has made mistakes, and there is no one on Earth who is perfect and can throw the first stone. Just my humble opinion. am i the only person who noticed the bulletin board? it just appears this visit was done way before hospice week. it saddens me when a good deed is ruined in a deliberate public relations stunt...or in this case a fail. If she actually visited in April, that's amazing, in the midst of all the tour hubbub. If in May (and the bulletin board was meant for both months) ,then she was indeed going on with her charities quietly , upon her return from the tour. Which I insisted she was doing, although some were very quick to criticize, because they hadn't been informed by the tabloids. May was less than 3 weeks ago. Some PR/ media person got it wrong. I doubt Catherine had anything to do with the release of the photos. She would have axed the bb , for one thing, if she knew it would be released in June. None of which sounds like her. Would like to know how the photos were released and who provided the info. Still waiting for the next scandal to be set up. Sorry to be such a pessimist. I'll be quiet now! If these photos are from April or May (with the bulletin board in mind), how do we know that she didn't do something private *this* week? We don't. But I'm sure some people would consider that a publicity stunt too. Would it matter Anon 23.50; 01.01?? It's about the children and the hospice. Not about being seen in media by people who only worry about if her heels match her dress. Not directed at you. Why would you use the word "PR stunt". Seems nasty and unnecessary to me. You are of course entitled to your opinion. Who cares what the date is. She did this behind the caneras and shows her concern for her supported charities. For crying out loud, for some she is in error. No surprises royalfan and marg.. I also think it pays to point out that just because a visit is private does not mean that the public should never find out about it. After all, the charities NEED the attention she brings. I believe a private visit simply means it's more casual and down to business vs. the fuss over an official visit. Very valid point royalfan. If the public didn't know what the royals were up to, it would truly defeat the purpose of bringing attention to an important cause. first of all i am not a kate hater; and i thought opinions and speculations were welcomed. the only reason i, anonymous 23:50, made the comment was NOT to be of any ill will. i was only noting that saying she went to the hospice this week with a bulletin board that reads "april showers bring may showers"does make the appearance suspect-along with the press association tag in the bottom corner of the picture. i just gets me as odd that the picture just happened to be released on hospice week. I'm one of the believers that this happened this week. Firstly, no change on the board. Happens all the time. I know when my girls were in primary school, work would still be on the walls from right at the onset of the year to the day they broke up for summer holidays. Nothing devious in that, I suspect? Secondly, Kate's face, still looks drawn as it has been the past week or two. Hair is the same length and colour as it has been this week and her "new" style of part introduced last week, appears on this visit. Thirdly, if this visit was done 2 months ago, why wasn't it made public to boost Kate's image. Fourthly, April was indeed during the overseas tour and I doubt Kate considered squeezing in an EACH visit just before she set off. Of course, one can reply with an excuse for any of my observations. But I still don't think this was a political palace tactic. 03:59- We do welcome opinion, if stated as opinion and not undeniable fact. If you are indeed a volunteer at that same hospice, you are a bit out of the loop. You don't seem to be aware that those photos , according to Summer, were taken by a fellow volunteer/parent or that they were likely taken expressly for this week. I really believe Catherine has made other visits, for which we have no photos. At least not yet. And I don't understand- "make the appearance suspect " of what? Maybe the problem here is you didn't fully explain a remark that could and was seen as inflamatory. I agree. Whoever in Clarence House or whereever indicated the photos were more recent made a huge goof. Perhaps you could tell us- when was the bb put up? is it still there? Where was it said that she went this week? I think this mis-understanding can be worked out and it would be great to have a volunteer at one of Kate's charities a regular poster here! Hopefully, with some kind of moniker, other than anon. I'm sure you have many stories and insights you can share. Anon 03.59: if you are indeed a volunteer at the hospice, maybe you can tell us when the duchess of Cambridge was there? And was the board up to date? I don't really think it matters when (date) she was there, or how that relates to the validity of the intention? I just think it's lovely that she visits. Maybe she visited before and they meant to publish the photos this week. It wouldn't be a big deal - unless they lied about it, which would be not only unappreciated but also unnecessary. Anyway, I did notice the bulletin and didn't think it meant anything. Why does it really matter when she visited. The point is thst she did and it was under the rader. And it was not the palace who released these photos, it was EACH that did. And why would they lie about it? Florence- are you my separated at birth twin? ha! I don't think it really matters when she visited, isn't it more meaningful the fact that she did? I'm curious also about this anon who claims to be a volunteer at this hospice. Wouldn't this volunteer know exactly when Kate did visit? I'm with Marg, Florence and Camilla on this one. I agree with Florence. And it appears to me that Kate visited her Hospice sometime in May, between the tour and a haircut. When she gave them her statement for this week, they looked for a photo, and someone had a couple that they used on Twitter. End of story. The only media tag I can see is on one of the old pictures, with Kate in the blue dress. Could it have been because of this? I haven't commented much because something didn't feel right, and believe it or not I don't like to rain on people's parade unless I have something to back it up. I thought the bum's rush of engagements (pun intended) was to counter the blowing in the wind scandal. Now I wonder if it was to get a step ahead of this. Marg, when I wrote your comment about the hospital corners.. Yes we were separated at birth! Ha! No, you have it backwards. The new "scandal" arrived just as I predicted-to counter all the good publicity from her recent engagements, which were planned months sgo- the annual ones, YEARS ago., including Hospice Week. You know this, bluhare.They c ertainly were not planned after one of the hosts took a picture when there were supposed to be no photographers to interfere with the visit, held it for weeks, and then strategically released it. So transparent. If the figures are correct (Really, quote the DM?) someone has been sitting on this story in order to release it at a strategic moment. With no engagements SCHEDULED for several weeks, the Cambridges have nothing with which to counter the "scandal." bluhare, I almost think you got tired of all the kindness and reason and just couldn't take it anymore. And I stepped up to the plate. Bluhare--Whoops! Time to get back out in the wind again!!! Poor Kate--if it isn't one thing, it's another! No wonder she sometimes looks drawn and thin!! 20 June, 01:29- "Still waiting for the next scandal to be set up." Didn't have to wait long. Gee that certainly got complicated. A small, quiet visit to a hospice in a recycled dress turned into a PR stunt for an upcoming scandal on home renovation. I must laugh! Everybody already knew that KP had asbestos removal, the apartment was a dump etc etc. OF COURSE it's going to cost millions of £!! And why the heck not I say. A building like KP needs upkeep, or it will not remain grand. It's a PALACE! (I'm not shouting, just passionate about old buildings!). I don't think it even is a scandal. Good on them for renovating the kitchen and installing several new bathrooms. Go for it I say. marg, no offense, but that comment is ridiculous. I got tired of all the kindness? No, I don't get tired of kindness. I get tired of being manipulated. And, IN MY OPINION, this "private" visit is manipulation. Of us. To get ahead of an unflattering story they knew would be printed. If you don't think you're being manipulated, fine. I do. The visit was at least a month ago judging by the board (and if you don't think that would have been updated before her visit I've got another story to sell you), yet this "private" visit was accompanied by cameras which documented it. Were they saving it for hospice week? Maybe. 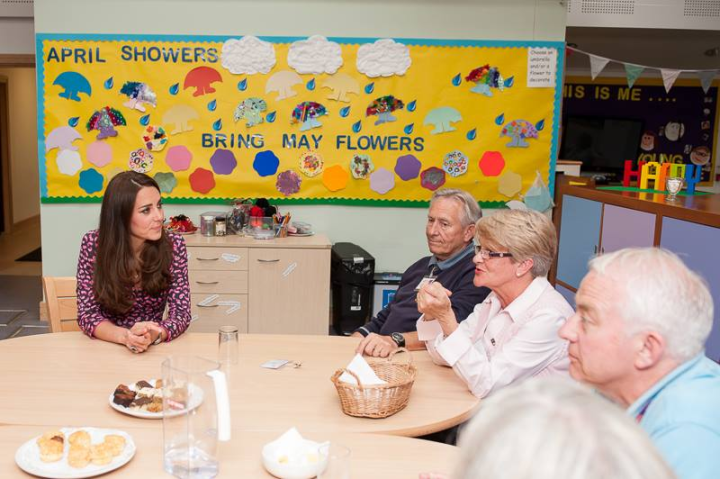 But maybe Kate could have made ANOTHER visit for hospice week during actual Hospice Week! One that could have been trumpeted as Caring Kate Visits Dying Children to Bring Awareness to Children's Hospice Week! I think she could have fit it in, even in a blistering schedule (by her standards). She didn't have a couple of the most recent engagements on her schedule a month or two ago. And Diana made private visits; she did. And she didn't take a camera crew with her on these private visits because, well, they were private! We didn't even hear about a lot of them until after she died. And I don't think Kate needs to worry about being more popular than Diana, royalfan. Kate isn't bucking the Windsors; they've got no reason to bring her down. Yeah, I'm a bit overwrought on this one. I was suckering in on the Kate train, and I'd even put my jellus h8r hat down a time or two. It's back on now. Blatant manipulation, that's all this is. Using dying children. I for one am disgusted. To add to my last post, the cost overrun for KP is about to be presented to parliament. You don't suppose this latest glut of appointments -- a few added quite recently -- has anything to do with that? To paint Kate as a caring patron instead of inveterate shopper? I do, and that's why I'm angry. I do not like being manipulated and this is as plain as the nose on my face. Trust me, it's plain. To be fair, I don't think it's fair to blame Kate entirely for this, and the Daily Mail has her on blast with the headline talking about "Kate's palace", with no mention of William. Not fair at all. And I'm sure that the building has had some unexpected issues come up. They always do. But four times the budget? That's huge by any standard. I would like to go back to my happy place where Kate's a pawn in the palace machine and they don't want her to succeed so they're locking her in her palace with loads of shopping catalogs and a computer. But I just saw behind the curtain. For once, I wish there would be some honesty instead of obfuscation and what feels like outright deceit. Florence- my separated at birth comment this time was in reference to our mutual statements, including-" if indeed you are a volunteer at the hospice..."
We had similar thoughts about bluhare's remark. She is getting a bit like Moxie, in that she drops a possibly inflamatory remark, then goes off into etherland, without defending/explaining her statement. It is called hit and run and is totally unnecessary for both bluhare and moxie. They are more than capable of a vigorous justification of their remarks. There are actually a number of us who not only see the handwriting on the wall- (I think you know this one, ESTI-it is an OT Biblical reference), but verbalize it. This has all been done before, many times. (someone mentioned Diana,) It has gone from press manipulation to character assassination. It is pitiful to me that people who treat the DM as an oracle of truth can't see they have just become tools to also be manipulated.And "monkey see, monkey do," the other media sites see DM is getting hits for a story and they run the story, too. Maybe trashing the royals is a cool, fun thing to do. I don't know what else can be said. I think those in the UK, especially, who play this game will soon be walking around without any noses; they will all have been cut off to spite their faces. Got it Marg. Comments and behaviour. Twins. Very funny! I guess we have to agree to disagree with some people. Bluhare, your comments are sharp, and you have an interesting way of looking at things. Do you really think there is so much conspiracy? Maybe I'm looking at it too simply? I don't think there's a conspiracy. I'm not a conspiracy theorist. I think there has been a campaign. I think it comes down to this, bluhare..... CH doesn't know what to do with W&K. They can't keep them out of the spotlight...not completely...but they don't want them in it either. I don't buy that for a second, royalfan. Sorry. You guys were starting to get me all soft and googly on these two but that's blown out of the water with the latest revelations. Nurseries and a kitchen for George, a new suite for WK, helicopter for appointments, and now William's supposedly taking on this East Anglia job and they aren't even going to be living there? While Buckingham Palace is falling apart if you believe those stories? bluhare, I think "stories" is the keyword here. And the stories are a combination of very bad PR from BP and the DM doing their own bit. Regardless of who lives at KP, the property should be preserved and I wouldn't expect corners to be cut. I believe the last time it was renovated was in 1963 (51 years ago). If the DM talks about mixers, well, that's the DM. And if it is being renovated, naturally it is going to be done with the occupants' preferences in mind. I honestly don't see a problem with that. If the budget had to be multiplied by four, well, let's point fingers at those who did the planning, with the understanding that problems always come up with old homes/properties. For the record, I do believe that William would prefer to fly helicopters and avoid the spotlight, but if the this didn't fly (pardon the pun) with the Queen, he wouldn't be doing it. I think this works as well for him (and his wife and son), as it does for CH.....for very obvious reasons, IMO. But the PR has been terrible and I wonder how much of that is incompetence and how much of it is designed to make him look bad. So what makes you believe that there are "campaigns" bluhare? I am finding your thoughts very interesting! Sorry, one more: why should we believe anything that the DM writes? Florence, I explained why I think there was a campaign. Kate had done nothing other than the tour all year until right after bumgate (which is what I thought all these engagements were to counter) when she went into a (for her) engagement whirlwind. Now I think they were a deliberate attempt by their PR people to get in front of this story. Better to get in front than try to kill it after it's gone to print. As to why you should believe anything the daily mail writes, that's up to you. There will be documentation coming when the report is officially presented. Also, as I asked below, we all talk about Daily Mail stories with no one wondering how true they are when they are favorable to Kate, yet people yell about lies and falsehoods when they aren't favorable. If things come out to prove all this wrong, and Kate was doing all these engagements out of the kindness of her heart, then I'll be happy to burn my Jellus H8r hat in front of everyone. Quite happy, actually. royalfan, I think I answered your question in with my reply to Florence. I'll add it would be difficult to make William look bad if he didn't. If you know what I mean. Even though some feel that Kate isn't doing enough and doesn't stand for substantive causes, I have to say that she jumped right in being a patron of a cause that is not easy to even visit and that many would not even attempt to embrace. I truly admire her for that. I agree! It's not a subject that is easy! Very well said Jo. I know it is not something that I could do. It breaks my heart to see children hurt and especially children with terminal illnesses. looks fine. Not dated at all. who are struggling so much. Hi Charlotte! Nice to see Kate's contribution to this important campaign this week as you had supposed! I'm sure her visit brought great delight to kids and their families. Probably when she goes without the media following her every gestures and moves, she and the kids can be more relaxed and she can interact even better with them! Anyway I cannot avoid thinking that the impact of a public visit would have been greater..she could do private visits during the whole year but, in my opinion, during this specific week a visit with the media would have been better! Moreover I don't think a written message, even if a nice one, can grab the attention from people outside the ones already interested! If she makes speeches (recorded or not) less formal and more about stories of people she has known there, how the charity helps them with concrete examples, I think everything would be much more useful! If you want to involve people with a cause you have to give a real context to your words. Probably it's not her fault but only a different strategy from the PR team or someone else. I always think the best of Kate and the way she works, so it's not a critics but only a personal perception..I'm sure she can reach great things with her charisma! As regards the DVF dress..I loved everything she wore during these weeks but I'm not a great supporter of this kind of dresses. Anyway it's appreciable she kept this one for so many years..twelve years??? and that she keeps wearing it even if her life is so different now..so, in all these changes, her tastes remain the same! Jo, I agree. Catherine comes across as a quality person, not a quantity person. I think that shows great character. She obviously really cares about the vulnerable, and puts in the emotional effort that such a cause requires. Well done! Great surprise post Charlotte. Thank you. Love the dress. Bravo, Kate! How does one top a first visit wearing her mother's dress? I suppose recycling one that's at least 12 years old might do it? Wrap dresses absolutely suit her figure and style. How fun to see it worn pre-wedding and in that setting as well as more recently and then today. You continually find us photos we've never before seen. I was curious about the photo credit released with the originals via Clarence House because it had a hyperlink embedded. It appears that the gentleman who took these shots is the father of a young boy with severe illness, and EACH serves their family. His portfolio includes some wonderful shots of their parent choir (they filmed a flash mob event with Sainsbury's help to publicize Hospice Week, also). I think it's fantastic that he was chosen as the only photographer for the event and had the honor of taking these memorable photos. Hndling the Duchess' visit this way creates such good will and positive exposure for the hospice cause, a more lasting kind than can be drummed up with staging, lights, cameras and copy deadlines. Not every time, no, but this time it works. Wow, just saw that the pictures was posted at each. Didn't see that emotional connection! Great choice! It never ceases to amaze me the additional points I learn from all of you commentators. Your astute observations are so keen. Thank you Summer for well written comments and informing us of the photographer. This just gives us more insights into another aspect of "behind the scenes". Hi Charlotte, just want to thank you for all you do to bring us this lovely blog. I know your busy with school and fiancee etc..... but you continue to bless us. Oh and I did pop over to The Royal Digest recently and thoroughly enjoyed the tiaras. Have a completely enjoyable, relaxing and delightful summer! I loved Alexandra's comment above. I REALLY REALLY want to know how to keep your clothing that nice for so long! Lo--probably wearing it only a very few times helps to keep it nice--and preserving it carefully. She's got a pretty large wardrobe--and, of course, with the life that she leads--it will get larger snd LARGER!!! hi charlotte, i really appreciate the time, effort and accuracy to each engagement. woman you are better than the press. now about the bulletin board it seemed pretty suspect to me as well. maybe it is because i work at a hospice facility-i've been a nurse for 15 years-and know for a fact that any form of decoration excites the patients/parents both young and old. trust me the patients look forward to the creativity for that month and something as simple a flower with their name in it or to make sure their photo is on a cake for the happy birthday board make them enthusiastic.so for that reason i became suspect, it's the second to last week in june and i doubt this hospice would leave that board up, especially with a special guest like kate. please believe me to the press and public these are secret visits but the facility knows ahead of time to prepare snacks, have security and to ensure all patients/parents are able to witness the visit. as someone who works for hospice i am hoping that this was not a pr stunt. i wish she'd visit more than once every two years because the hospice charity is always in need. What is all the fuss about---the photos were released via EACH's twitter, along with yesterday's statement from Catherine to mark Hospice week. Every female member of the extended Royal Family has a Hospice among her patronages---none has visited this week, but William and Catherine are the only ones who have NOT spent the week at Ascot. Doubtless Catherine has to arrange activities to ensure George is cared for. Yes I know there is a nanny, but she can only work so many hours in the week. Whatever some people think, we should be aware by this time that her child will, quite rightly, come first. Well put Jean. She knew this week was a busy one with Trooping the Colour, Garter Service, visit to Benchley Park etc so she attended EACH in advance of Hospice Week. One article in the press said it was earlier this month but it does not matter when she did it. The point is she did do it and did not ignore her charity on what is its most important week of the year. Which is why the picture and statement were only released this week. There is an article in this week's Hello magazine that says she is going to put William and George first before her duties and she will only carry out engagements in blocks for the foreseeable future. As much as we would like to see her all time we have to remember Catherine is married to the heir's heir and her time will come when she has a more extensive role in the Royal Family. Agree fully! It was not put forward by the palace. It was EACH! And it's clever of EACH to do it during this week. Because of the week a little more interest will be placed on hospices. That is the perfect PR timing to put forward their royal patron. It's good PR for them and Kate. But just because it's good PR doesn't mean it isn't a good deed aswell! Catherine has it right. She has always put William first and that is the way it should be. And just because she is royal now does not mean she has to change. Catherine has now always put George as her priority first and William. I believe this is what William wants and we know what William wants William gets. I alos read where Catherine will only be doing a few engagements at a time in the near future. That also is for William too. Baby George is there main focus. Job or good deed, that is the question. Thank you for being so sensible and putting it so succinctly. Who is swanning about at Ascot and who made sure one of her most important charities could benefit from her under-the-radar PR. Seems as if she can manage very well without any of the armchair PR 'experts' at DK. Very well put Jean! I admire her for putting her husband and child above all else. Wolfpup, always the negative comment. Can always count on you for that. HI WOLFPUP!! Hadn't seen much from you and was worried !! Could it not be both good deed and doing a good job? Wolfpup;-are you ok? Is sonething not all as it should be? What concerns me about statements about Kate prioritising William and George and not taking on much work, is that they are seriously running out of time to learn from the more experienced royals. Habits are set at a young age. If a habit has not been formed early, it takes an adult many years of practice to develop the said habit. William and Kate are still not seasoned royals. They need to start their learning curve now. Not when their children are fully grown and have moved out of home. Both have much to learn from P Charles, the Queen and many other "full time" working royals. William only recently has been without another pursuit. First there was his schooling, then his piloting career. This excused him from many public obligations. As a couple due to reign in the near future, I'm not convinced they are inclined to begin learning "the ropes". William may be born into the family, but that doesn't offer a guarantee that he is automatically "ready". I think Kate, initially may have tried to initiate some learning from P Charles and the Queen but seemed readily to take a back seat after a year of doing so. I get such a strong feeling that William does not want to be seen as "compliant" to his father. He wants to be seen as independent, strong and capable of making his own decisions (against his father's and the Queen's wishes), regardless of the repercussions. This part of William's personality worries me as a future ruler. I'm hoping Kate keeps him grounded. But presently, as long as William continues his firm stance against his elders and continues to get away with it, he and Kate can and will continue to take on a light workload. I am saddened to think of the many learning opportunities they will miss out on from some very well respected working royals. If you read the Courrt Circular you will see that he has been accompanying his father to meetings. and has started to take over Investitures etc. I hope William and Catherine will still continue in their own style at charity events and visits to various parts of the country---but learning what a king must know, takes place much more privately. Does it have to be one or the other? If a fireman rescues someone from a building that is his job and that's what he gets paid for. But that doesn't mean he isn't doing a good deed. I'm not saying this is the same thing as visit a hospice. But you get my point. The Court Circular shows Duke of Cambridge present at Prince of Wales events he will need to know about in the future. His training continues, but the Daily Mail doesn't focus on it. I'm glad to hear that this is in fact what is going on. Will have to navigate the CC to find this information as I do find it intriguing as how William is being groomed. I do believe that Wiliam inherited that independent, stubborn , strong-minded streak from Diana. As troubled as she was, in sone ways , in other ways, she was very tough...and it took guts to stand up to Charles and the "men in gray" in the palace system. I think he'll grow into his role as a very strong, caring leader of great charisma. But I believe that Charles is just as stubborn (IMO Diana was given a bad rap for that quality). Camilla wouldn't be his wife today if he wasn't. He disregarded his marriage and risked the reputation/stability of the monarchy to have non-negotiable Camilla at his side. Hi, I don't post here very often but I just needed to let this out. I don't understand why "when" she made a visit is a huge deal. I mean it won't still erase the FACT that she made a private visit. It was "private" in the sense that it was made without the media fanfare that usually surrounds royal engagements. It just makes sense for EACH to publish the photos in their website during Children's Hospice Week, as that's what the week is all about - raise awareness about the charity and the work that they do. I'm sure the charity would be delighted to know that with just 2 photos and a statement alone, this generated a huge deal of publicity for them. I've been checking up online articles (there were a LOT) about it so hopefully a lot of readers would be inspired by the charity's work. This is what royal patronage is all about - raising the charity's profile and awareness. It's kind of sad that people need to be critical about everything Kate does. In my opinion, it is okay to be critical but for something as positive as this for both the charity and Kate, I just don't see the need. Thank for your comment. I fully agree. On the bulletin board issue I did not notice the year so it could be a two year old pic in their archives. 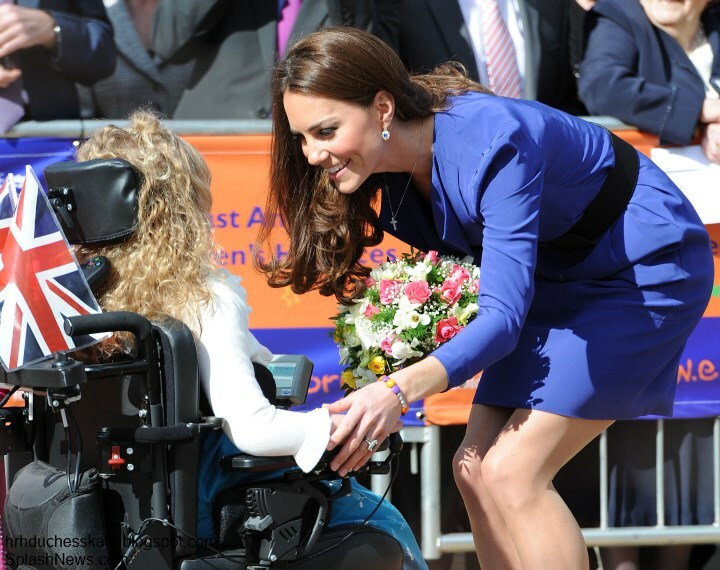 Kate opened the facility in 2012, which was new then (blue dress). As you say, last year she was pregnant. The newer pictures, according to EACH, were taken when she visited 'recently.' The photographer's website shows pictures of weddings and a military wives' choir and the EACH choir. He apparently has a child at Treehouse. The pictures are on the EACH website, but I have searched the royal website and did not find mention of Kate's recent visit. Does someone have a link? I hope William has had a Happy Birthday. No pictures of him and Kate from Ascot; he apparently celebrated quietly and privately. How very nice of Kate! This is the kind of work I love hearing about. Hospices are very sensitive subjects and I'm sure that's one of the reasons why private visits work very well. When I first read this post, I thought, how wonderful of Kate to visit! Then I started reading the comments and began shaking my head. It is grossly unfair to call this a publicity stunt when it is anything but. Who cares if she went this week or last week or last month? The fact is she did so under the radar as she maybe does without our knowledge. I would be more impressed if she went last month because it could mean a random visit. Maybe we should stop making conclusions from a bulletin board. EACH posted a fun video of Treehouse 2 days ago and it still had the same bulletin board up. And if I were to be very frank, the only thing suspicious here are the commenters who claim they work or volunteer in such hospices and put a damper on the whole thing. People who work closely with charitable organisations, in my opinion, will be the last ones to call this a PR stunt. So bravo to Kate and thanks to Charlotte for sharing this with us. It is actually the definition of publicity stunt: to release images to the media to garner publicity. It wasn't "news" because it didn't happen on the day it was revealed nor covered by the independent press corp themselves to provide the story. It falls into the category of prepared advertising. It was released simultaneously by the foundation, royal press office, and EACH. I know it’s DVF, and I know it’s paisley, but I still think her dress looks like bacteria. Not a choice I would've made for a hospice.Usually I love paisley, but that print looks like things growing in a petri dish. Superficial aside, glad to see her actually out and doing something for her patronage. Doesn't ‘secret’ work defeat the point of being a patron, which is to publicize your charities? Maybe doing a quiet visit and letting it be publicized by EACH on its website was out of consideration of the children who are so terribly ill.
A calm atmosphere and visit with Kate --no hordes of strangers and cameras flashing and an over-excited atmosphere to upset very sick little ones. Very suitable outfit for such an important occassion. God bless the duchess and those children. Thank you Charlotte for all your hard work in recent days. Don't really get why people think "under the radar" charity is something to be praised. The RF should be publicizing and trying to raise awareness with the public, not doing things "behind the scenes" that people don't hear about. I agree Beth. If Kate was out and about a lot for her charities, a private visit or two would be no big deal. But she's not, so at this point the more she can be seen doing any sort of work would seem to be a good thing one would think. I totally agree, Beth. Being patron of a charity isn't about private visits. It's about getting out there and banging the drum for that charity. i currently have a best who is residing in a hospice facility and the one thing ALL of these facilities need is money and publicity. from first hand experience the cost, both emotionally and financially is way beyond the means of comprehension. i'm glad she showed up but i wish she did show up with the aus/nz royal tour press because it is not only the patients but there are parents, loved ones and staff who take love/care for each individual as their own. funds and awareness for these centers are needed on a daily basis. so she does need to have a crew of cameras and tv presenters every time she visits. i know she can't cure ant diseases but with her public visits she will catch the attention of someone who possibly can. her mother-in-law through very public visits educated practically an entire world about AIDS --most people at that time believed it could be spread through contact by actually touching a victim of a disease. Kate is well aware that she does have a role to play as a royal. (regardless of how far away she is of becoming consort). At this stage, her role includes some public work. Her "job" was to bring awareness to EACH for Hospice Week. It may have been at her initiative or her courtiers, but she still did it. If Kate was enormously interested in bringing more support to charities, she would have taken on far more than what she has to date. (before her pregnancy). She would have also volunteered a larger portion of her time towards assisting them in their most needy areas. I do believe Kate has a heart and is compassionate, but is struggling to "define" her role in the FIRM. At the moment she is simply happy to do as she's told. Been having some issues with my computer, but I agree with you, Helen. I'm delighted that Kate visited the EACH hospice some time back, but wish she had visited one for Hospice Week. Still, some attention was brought to Hospice Week and that's the important thing. A good time to thank Charlotte and the others for their great work raising money for Hospice with the Baby Cambridge Fundraiser, and to all who contributed. Diana did private visits but she also did a huge amount of publc visits. There is a benefit to the latter because it gives far greater publicity to the charity. As the Palmer article pointed out, this can be hugely beneficial. I doubt the families cared whether the visit was private. The publicity would be a novelty to them and many families would welcome the attention. And photography is always limted and controlled inside. I tend to think the private visit was more for Kate's benefit than for the family, possibly so it could be brought out this week when she didn't want to do an enagagement for some reason or maybe it wasn't a good time for the charity. That April sign does make the whole thing strange but at least she visited and that's what counts. I thought she looked very nice in what's obvously and old favourite dress and she relates beautifully with the children. But seeing is believing and I don't think I'm going to buy into the Duchess doing a lot of behind the scenes work until there is a bit more evidence than this one visit, apparently some months ago. We all believe what we like. Whether what we believe is true or not is another matter. But we might want to consider for a moment that Kate's "job" (besides wife and mom) is one that is comprised of many "good deeds". These cannot necessarily be separated one from the other. For what purpose? What would it serve to have a column for each? Numerous professions including nurses, teachers, priests, first responders and the like are ones which call on the "employee" to serially do much needed "good deeds" in the interest of the public good. We can't rely on casual bystanders in those instances. There is nothing wrong with being employed for the express purpose of doing good deeds fundamental to the function of the larger whole. But there is something wrong with tossing off people's contributions or their good deeds because "they are only doing their job." It seems rather petty and small-minded, not to mention grossly ungrateful. Yes, Kate has a pretty unique profession in spite of those who have said that she does not work. One that comes with a great number of perks, but also enough limitations to drive most of us bonkers in the first month. Don't forget that she worked before she was married, too. Except that some people refuse to dignify what she did as real or meaningful or worthy. Who are they to judge--especially when all the "evidence" is derived from the press? Some of it gutter press hacking private telephone conversations and pointing lenses into moments that have served no one except the paps' and papers' profit margins. Kate is doing a job that happens to include a "good deed". Further to my point, I believe she is primarily doing a "job" that she is told to do. If Kate prioritised just doing "good deeds" we would have seen much more of this kind of work from the onset of her marriage. It has been documented that the Queen's courtiers experienced much frustration with Kate who was not so keen on representing charities once she entered the royal family. There may be many reasons for this. But she DID have the Queen's support to do plough right in. I think Kate can has the right personality to take on this kind of work but it seems a shame she didn't represent herself better at the onset. I wouldn't say these comments are "petty or ungrateful". Kate's just doing what any royal in her position should do. Which primarily makes it part of the royal family's "job". Helen, where has it been documented that the Queen's courtiers were frustrated with Kate? I do enjoy the variety of different opinions that you all have. You also provide me, the reader, to invoke more of a thought process. As I began reading the blog, I thought of the many under the radar visits Diana had done of which we only learned after she was gone. I like to think that Kate is no doubt visiting her causes privately and we will never know the extent or quantity of these visits. It does not matter when Kate visited EACH only that she chose to visit without media which as others have noted makes it more comfortable for all parties involved in the event. Kate chose to wear something out of her closet without thought to the view of the camera because this was just a private visit to her cause. Kate thoughtfully chose a printed colorful dress that these young children would enjoy seeing her in. And still she looked radiant. Thank you Charlotte for sharing this private event with us. If you look at Twieets from Royal Reporters, the Queen has not bought a helicopter for William and Kate---she has leased one for the whole family to use. Said to be more economical and safer that booking one for specific engagements. Also safer---not long ago a helicopter in which the Prince of Wales was travelling got a problem and had to crash land. The DM is causing trouble again---though they do manage to mention that it is leased at the end of the article. Well, it's the Daily Mail after all. Sensationalized headlines especially involving William and Catherine sells papers and get a lot of clicks for sure. I liked how Dickie Arbiter, former press secretary to the Queen and Princess Diana, replied to one of the royal reporters to get it right. It's funny and disturbing at the same time how the papers twisted the story in their headlines (as if the helicopter is just for W & K). I agree. It's just tabloid formulations! It's for Chales and Camilla too. And the new info about the cost of refurbishing Kensington Palace, yikes. How ironic. I was so annoyed with the DM that I posted my own comment just now and it's practically identical to yours. HM & PP very well may have learned from their own experience---and from reigns going back for centuries....that putting duty ahead of establishing and maintaining a solid, loving, and nurturing family life can be very bad for the Monarchy. Those wearing the crown need to be secure, stable, and able to reach out to people and relate to them---while providing the unique leadership, stability, and national pride that is possible with a solid Monarchy. I think that William & Kate are being given the time needed to do just that. I totally agree with you Jean. But the DM chose William's birthday to release this rubbish. If this is not bullying I wonder what it is then? For the simple pleasure to hurt him on his special day. And thereby Kate too. It all started with that Closer thing. Hence, this outburst of animosity against him and his little family. I can say I understand his dislike of the media now. Anyway, HAPPY BIRTHDAY TO YOU PRINCE WILLIAM! Let the world say what it will. Meanwhile you are a happy man with your wife and kid. And this is what they just can't stand, isn't it? The DM IS an abusive , nasty bully that clearly operates on the premise that when it says something to make either William or Kate ---or both ---look bad, no one will notice how mean-spirited--or even vlcious they are being--as if they're so superior they qualify to criticize! I doubt they'd like being treated the same way!! Another quick thought---maybe the helicopter also serves as a compromise. .William can do a bit more flying AND more engagements! Since Prince Harry is said to be living in Nottingham Cottage now, I expect he will someday move on to Apartment 1A when William becomes Prince of Wales. Or perhaps Charles and Camilla will continue to reside in Clarence House when Charles is King, as his father once wanted to do. In which case, Kate and William will probably be at KP for many years. No running water?? We know Apartment 1A had running water when the famous picture of Princess Margaret in her bath with tiara was taken! And she raised two children as well as entertaining there. She lived there during the 20th century, after all. What had been done to this apartment to turn it into office space? It had no restroom of snack kitchen for office workers? Strange, since obviously it had had those facilities. I wouldn't be surprised if Prince Charles asked for the lease of the helicopter. He and Camilla were endangered by flying during the old system. I cannot imagine Camilla settling for CH when that gray day arrives. I'm sure she has her decorator-sister on standby. Apartment 1A has been last refurbished in 1968 when Princess Margaret moved in, so that makes it more than 50 years since there has been any major refurbishment. When Princess Margaret died in 2002, it was used as STORAGE by the RHP hence it was uninhabitable. It's actually the state's duty to preserve this historic sites, so at one point, renovations would have been made regardless of anyone moving in or who moved in. I just realized there has not been a shot of Kate shopping for the last several months. Either she is doing mail order, is up at her north county estate or has increased her security. That could mean threats against her or William and that may be why they are lying low. Another point is both William and Kate are reported to be hands on full time parents and frankly the child seems like a bit of a handful. I wonder if they are spoiling him which will make it hard for him to conform to the expected behavior in the future. Look at the children of the King of Spain they are older but so well behaved. Will and Kate will get criticism if they are hands on and the child continues to be wild. I think sometimes that is the childs nature and the two of them sitting around the child won't raise a mini king without good parenting. Presence and saying one is hands one may earn them more criticism in the future. They have a full time nanny, so they aren't full time hands on. If they are, they're wasting their money on a nanny. They should look to Victoria and Daniel of Sweden for how to manage a small child in a public life. They do a wonderful job. bluhare, given Kate's family background, I just don't see her wanting anyone else raising her child. I think they have a nanny *available* on a full time basis, but I don't think she's in the picture full time. Hope that makes sense. Lol. I don't think this does William any favors. There have been too many stories about his royal status (full time vs. part time). Although I'm sure it has the FULL support of Clarence House. As per Victoria Arbiter, none of William's decision will be made without the Queen's decision. Also, take it with a grain of salt because of the source - DailyMail. They published the same story last month (or a few weeks ago) and are just rehashing, much like the story on the KP refurbishment and the misleading story on the helicopter lease. I think it's the media's unique way of greeting William a happy birthday. This morning DM also started on Harry publishing details and mobile taken photos of his time on a private wedding in Slovakia. So many inaccuracies being reported in the media re: royal finances. mslex, I agree (and just stated that in another post). None of this would be happening without the Queen's approval. Unfortunately, the PR has been terrible and the DM's tactics don't help. I am livid. Why are the taxpayers paying for a Kitchen Aid mixer ? Their personal millions could not be used for that purpose? All of this is coming out of official documents. "William and Kate’s choice of sophisticated appliances by German firm Wolf – one oven costs about £18,000. The couple have also invested in a huge American-style double fridge, a chest freezer, and a £500 Kitchen Aid food processor." I understand the need to restore the building, but THIS? I am with bluhare on this one. Shame on the family for using dying children and shame on them for fleecing the public. Thank you, anonymous. I was feeling a bit lonely on this one. I hope, against hope, that there was a budget for these things, and that anything over than the allowed amount was paid for personally. I hope that happened; I somehow don't think so. I also hope that they personally paid for the repainting that had to be done because Kate didn't like the color. Spokesperson on KP refurbish: "As with any part of the estate, it was the royal household who were responsible for the refurbishment. The royal household oversaw the planning, tendering & project management of the refurbishment and were responsible for the budget & spending. Kensington Palace is a scheduled ancient monument, and all elements of the refurbishment had to be agreed with English Heritage." As reported, William and Kate paid for the internal furnishings including curtains, carpets etc. Both of them have their own money. As for the works done on the property (by Victoria Arbiter): "All I have to say about W&K's apartment. The place had not been touched in 50 years since Princess Margaret moved in in 1960. It needed asbestos removal, rewiring, a new roof, new kitchen etc. regardless of who moved in." Funding came from the Sovereign Grant (as per Victoria Arbiter): "Sovereign's Grant = money given to run the institution of monarchy. Comes from the Crown Estate a profitable org. run on a commercial basis. The Sovereign's Grant is NOT money taken from the tax payer." I guess in this case facts should not get in the way of a good story. It's not the refurbishment that's annoying me to no end, although I could probably get there on that alone if I read more, it was the PR campaign of engagements etc. etc. ahead of this. Here I thought she was finally starting to get into her job, and it's just PR ahead of this story. It's so obvious now and I feel like a moron for buying in. PS Just out of curiosity, and this isn't really directed at you but more of a general question, why do facts get in the way of a good story when not favorable to Kate, but no one ever questions the facts in stories that are favorable to her? And furthermore (I'll quit soon; promise!) the asbestos abatement and roof (and maybe the rewiring; not sure about that) were part of the initial 1 million. Not the latest figures. And I think there's more than one kitchen. I've read three, but that seems a bit much. "why do facts get in the way of a good story when not favorable to Kate". I'm sorry but I don't understand the tone of this. I'm just laying down what has been said about the KP refurbishment and this is not just about Kate. In the first place, it's not like it's her calling all the shots here, I have no problem with being critical with Kate or any member of the royal family for that matter but I'd like to form my opinion based on facts instead of my own prejudices because honestly I don't know any of them personally. I guess I could ask you the same thing, why when it's something unfavourable to Kate, it's easily fact and the press reports should be trusted and not to be questioned, but when it's something favorable like her doing something for her charities, it's just PR. If they do something bad, call them out for it. If people have a problem with the institution of monarchy, lay down constructive criticism and aruguments instead of using/discriminating people just because they are popular (tell me the helicopter story is not sensationalism). It's not like William and Kate are the only royals spending money. But then others' expenditures rarely get reported because it doesn't sell. By the way, BBC said that the budget reported has not been confirmed, since the official numbers will be out next week so I guess we better wait for that. Catherine's and William's most important task is to do a good job of raising their son. By the looks of things they are doing an excellent job. There will be plenty of time for her to have a fuller schedule in a few years. The first three years of a child's life are such critical ones and her focus on her family should be commended. I doubt very much taxpayers aren't paying for it. That information came from the daily mail. They aren't exactly a reputable source. I just read that article myself. It says Prince Charles is paying for it. Then goes on to say the taxpayer is. They talk in circles. It is a poorly written article. No different than CBC reporting that Queen Elizabeth gave William an 11 million dollar helicopter for his birthday. That is not true. The royal family is known for being down to earth with their gift giving.